So, number of hotels in Chennai are celebrating a modified version of the German Oktoberfest, but I was glad that one property was celebrating it differently and was rather intrigued when I was invited to the Idly and Beer Festival at Marriott. Oktoberfest here is not the sour dough breads or the various beers and pork, but our very own idly served with beer. And for the good boys like me (and my friend who came along), who don't drink beer, we were given a mocktail. But the bad boys, they don't get just a glass but a whole pitcher of beer! The idly - well, when the non veg platter of idly was served and we picked up one piece, I tasted mutton chukka. And both of us were searching for lamb all over the plate and found none! It was the Kaima Ellu Idly! Picked up another piece from the platter from a different side and we tasted chicken and ditto - not a single piece of chicken and it was Kozhi Kothamalli Idly (Chicken coriander idly)! Now, if you are looking for large chunks of meat, then this is not for you, but if you are looking for something unique, then this is a must try. 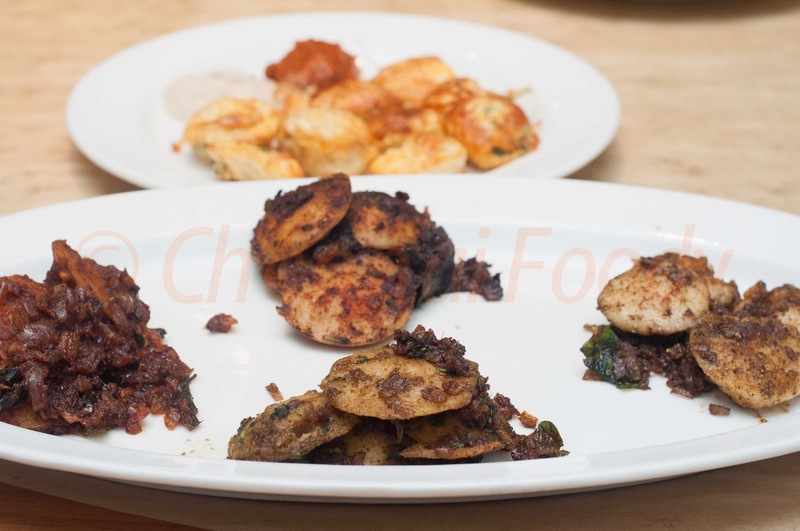 The meat had been pasted and has been infused in the idly batter itself and stir fried with spices, so technique leaves the unique meat flavour with the consistency of the idly. 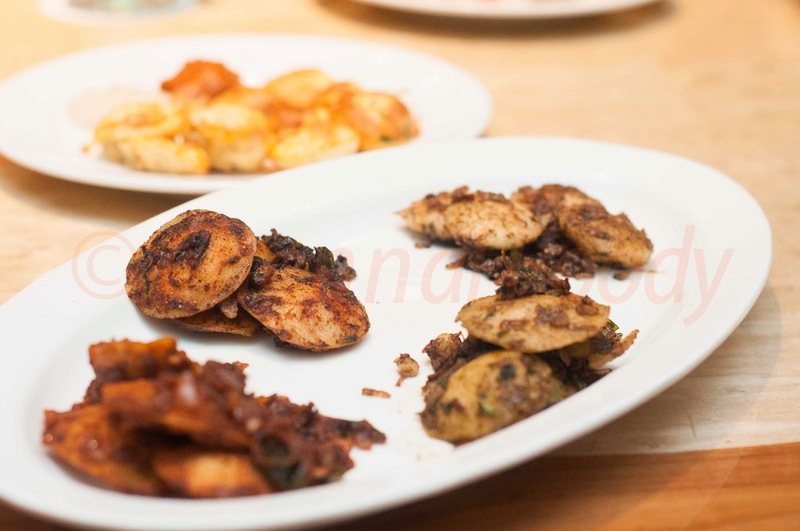 The vegetarian platter was very similar, but the flavours had not been infused so well, so it was more like stir fried idly. I loved the concept and for the price, it is definitely worth a visit. 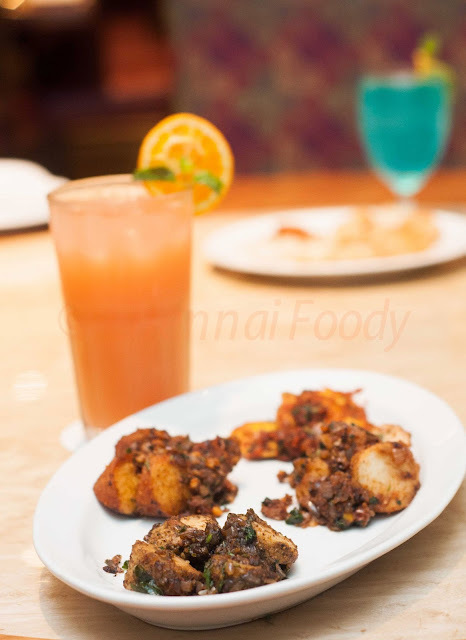 A platter of 16 mini idly with a pitcher of beer or mocktails is priced at Rs. 650 plus tax (550 for the veg version). You don't have to order a platter per person and they are perfectly OK with two people sharing the platter and the pitcher! 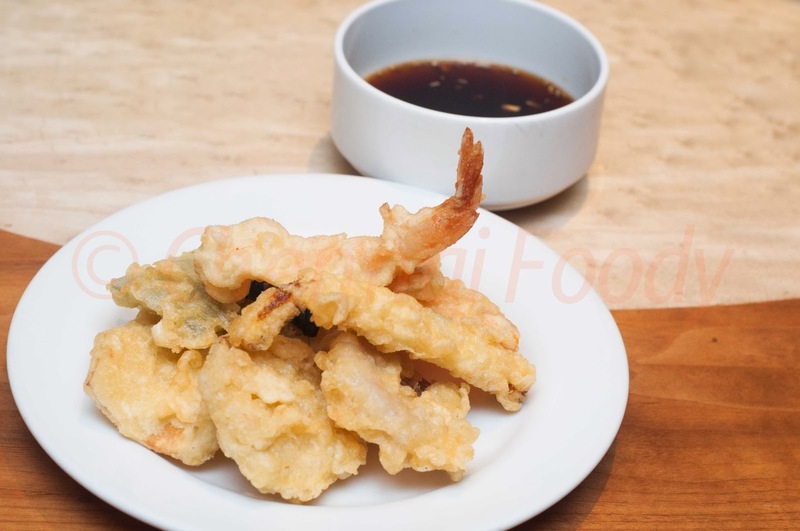 Incidentally Marriott has a street food festival as part of their buffet and the batter fried prawns were yum!